Boris Mikhailovich Kustodiev was born in 1878 in the family of the Astrakhan gymnasium teacher. At the age of fifteen, the artist began to actively master the mystery of drawing by the Russian painter Pavel Vlasov. Then Boris entered the Academy of Arts, located in the city on the Neva – St. Petersburg. It also became a popular portraitist, participated in the creation of a number of masterpieces, together with other artists and worked with a number of publications. In 1920, Boris Kustodiev created his work “The Model”. Call it a complete picture is quite difficult. Rather, this work is a sketch. It is made on paper, a simple graphite pencil. It has an average size of 35.5 by 22 centimeters. At the moment, the work is kept by a private collector, whose name is not known for certain. At the heart of the plot – the image of a young lush lady. 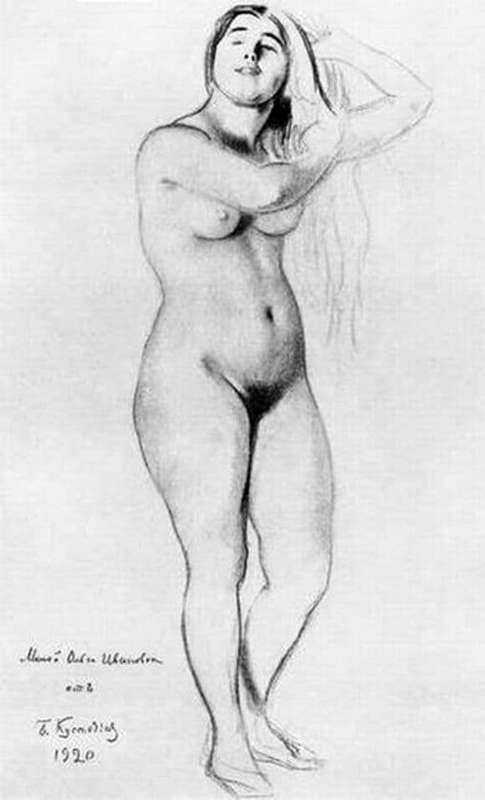 She is naked and is busy turning her hair back by tilting her pretty head slightly. The master pays special attention to the elaboration of the forms of women. Even the small details of the hands and feet, features of the body and facial features are not left unattended by Kustodiev. Light understatement remains only when drawing hair and one hand. The position of the girl is relaxed, there is no tension in it. One knee is bent for greater stability. The face expresses calm and joy. Lips touched unobtrusive smile. The picture is full of real femininity. The artist with great trepidation depicted the image of Russian beauty, languid and calm.